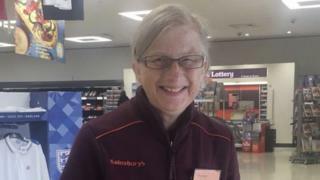 Image caption Mrs Salomon's continued work gave her a "sense of pride and self worth"
The son of a woman with Alzheimer's has praised Sainsbury's for keeping his mother in a job as a grocery picker despite her illness. Doron Salomon, 29, thanked the supermarket for employing her for five months after a medical exam rendered her unemployable in October 2017. Her job at Sainsbury's in Kenton, north London, gave Mrs Salomon a "sense of pride and self worth", he said. The supermarket described Mrs Salomon as an "inspiration to all of us". In a series of heart-warming tweets, Mr Salomon told how Sainsbury's "acted with compassion, class and dignity" and hailed the store for going "above and beyond". Mrs Salomon, 61, started working at the store in 2012 and was diagnosed in late 2013. Mr Salomon's father was called in by its management "on numerous occasions" and "every time we thought that would be the end". He said: "It never crossed their mind that she would be unemployable. It was always 'what can we do to help her?'" When her illness became a "real problem and Sainsbury's realised she couldn't do the job particularly effectively, they stepped in and found other jobs for her to do", Mr Salomon told BBC 5Live. Eventually, Sainsbury's created a new role for Mrs Salomon dedicated to cleaning tote boxes. "It gave her a sense of purpose," Mr Salomon said. She completed her last day on Saturday after "it had got to a stage where she was going in and doing nothing". A spokesman for Sainsbury's said: "Doron's mum was a much loved colleague and an inspiration to all of us. We'd like to thank her for her years of service and wish her all the best for the future."